The upside down logic of fasting. Is it just me, or do kids have a build in “fairness detector”? One kid is allowed to do or have something fun and now all kids everywhere should be given the same advantage. As a family, we do feasting really well. If we’re not careful, we begin to get a little entitled to our indulgences. And media seems to be my children’s indulgence of choice. And I pacify them. Giving in to what they want because it quiets their demands. Now this is not a rant on media in the home. I’m not down on getting a few minutes of peace and quiet by using electronic devices. But I’ve seen the ugly side of feeding this monster. In proportion, as the indulgence rises so does the entitlement and before I know it my kids are demanding that they have a screen in front of their faces with a never ending supply of snacks all-day-long. And the sweet faces of my children turn into scrunched up dictators commanding that their want for more be satisfied now. And it only gets worse with age. When my little ones were 2 years and younger, I only allowed scheduled times for screens. And their choices were limited to whatever programming was on PBS. At this age and stage, I finally realized that I was the problem. I was the one wanting to turn it on and be entertained by Martha Speaks for 30 minutes. The fasting at this age was geared toward me. I was the one with the personal discipline problem. My little ones had no idea what they were missing when the screens were off. They were so quickly and happily distracted by a number of little things. Fast forward a few years, and my 5 year old knows PBS’ scheduling by heart and calls out what we happen to be missing as if we were standing up an friend. And sometimes that’s what it feels like for them. The shows seem to provide a type of companionship or club membership and to miss out is to feel a weird loneliness. But after attending a seminar at The Great Homeschool convention in 2014 entitled “Media on the Brain” I was completely convinced that this “loneliness” is a symptom of addiction. The research, science, and evidence says “the majority of American’s qualify for having an addiction to media use or media exposure.” This launched me into an all-out war against the hypnotizing and behavior controlling influence. 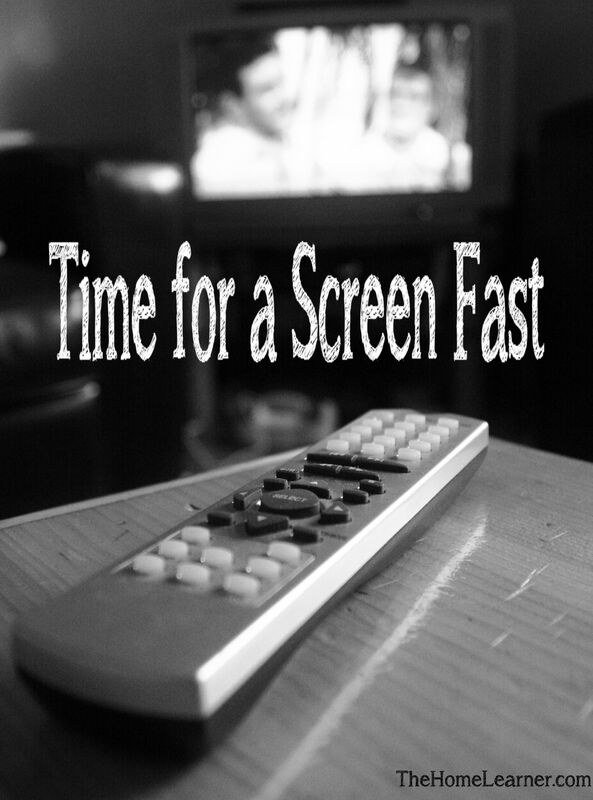 So from May – August 2014, we fasted from screens. It was the perfect timing to have a reset. The kids were free to enjoy the outdoors. And I saw clearly that less was more. Upside down logic. When they were indoors we focused on reading, and to my delight both of them not only began reading (ages 4 and 6 at the time) but they moved quickly into a 1st grade reading level. My daughter who had been struggling to read because of fear of failure was asking to read the same book (a 2nd grade reading level!) to me over and over. One of the reasons we needed a “reset” was to correct selfish behaviors. The kids had gotten into the habit of fighting with one another. It was vicious and vindictive. And they only wanted to be quieted with a screen. More screens! More screens! Was their battle cry. I knew the only way to get their full attention and solve their relationship conflict was to unplug. In August, when we could tune back in, it was rewarding and satisfying to pick and choose what we would and would not allow to reenter our “screen routine.” I wanted to make sure that any signs of addiction were addressed head on from here on out. I planned regular ongoing fasting and declared “No Screen November.” And in that I learned that no screens in the summer was wonderful and freeing, however, no screens in the fall was confining and made it difficult to find a change in perspective. We listened to a lot of books on CD. And that’s when I realized that fasting takes time. Learning to fast well requires practice. It casts light into darker corners of our routine that the glow from a screen kept us from seeing clearly. Fasting helps me see the things in my life that I want to keep there on purpose, and allows me to let go of things that may be pretty or distracting but only take from me. Fasting feeds my soul and nourishes my commitments. Learning to fast well takes time, and it isn’t a matter of perfection. To truly value what the fasting teaches me, I can’t get hung up on failure or allow myself to be discouraged by the struggle. Learning to fast with contentment is more challenging than teaching it to my kids. Something good. That’s a teaching point for my kids, I want them to hear me when I say that enjoying a movie as a family, or watching an episode of Odd Squad is a good thing. It is not my intention to teach them that all media is bad and therefore we should fast to clean ourselves from it. Rather, we are giving ourselves time to actively consider all the areas of our life and choosing to spend ourselves on what really matters to us. In this space that fasting creates, we are free to realize our fuller potential in zealously developing our gifts and natural talents. And my kids are old enough to see this. They embrace the balance fasting brings. In instituting a fast, there’s no one way to do it. We’ve done one day, one week, one month, and one season fasts, and sometimes I prepare them for it and other times it is a spontaneous decision. The one thing I strive to be the most consistent about is my word. When I say we are fasting, and for how long, then we follow through on it. No matter the amount of “surprise” costs on my end. Making sure my “yes” means yes, and my “no” means no. Fasting is strangely similar to simplifying. Learning to say no, not now, or taking the time to organize it to save it for later – those areas of personal discipline cross over. But in fasting the impact is deeper and more spiritual that just decluttering a shelf. Fasting breaks me down to the center and reveals what I value at my core. It’s worth the short term losses to see these long term gains. Let me know if you’ve tried fasting and what from – would you do it again? For more encouragement from The Home Learner, click here.